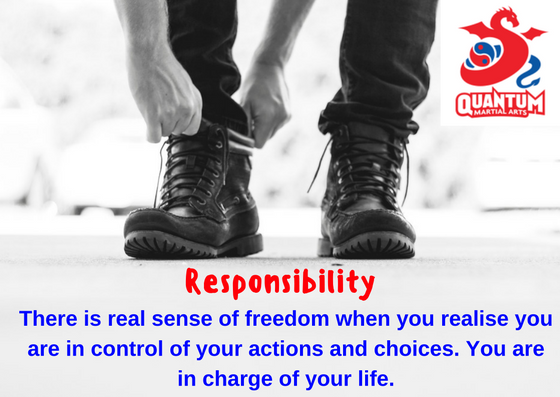 Responsibility is a wonderful quality to develop. You can anything you want to in life, but you must take responsibility for your life. Do you do what you say you will do? Do you refuse to make excuses, no matter how much the ego wants you too? Do you do things to the best of your ability, no matter what you are feeling inside? From your very first martial arts lesson, you have the ability to be responsible for your own progress. One of my first martial arts instructors said that the secret to being good is simply showing up to class. This is responsibility at play. However, you can take that responsibility further by showing up to every class you committed to. It was you who committed to doing martial arts. For that, we applaud you. Now, you must be responsible for carrying on with that commitment. You will always have our support. For each grading, ‘responsibility for your actions’ is tested as much as the syllabus is. There will be a variety of self defence techniques, ground defence techniques, and techniques against multiple attackers. There is also fitness that needs to be taken into account. While your instructors generously give their time to “build a better you”, as a student, you must take responsibility for learning and remembering all of your requirements. This helps “build a better you”. I do not say the above to scare you or “pass the buck”. I always feel a sense of freedom when I know that it all up to me as to how far I progress. It is a terrific feeling knowing that you are in control of your life. In class, the instructors will always push the students to perform better than they think they can. This is our responsibility as instructors. We do this because we have been…and still are…students ourselves. The instructors are not perfect. We also have those little voices in our head telling us to stop. However, our experience has allowed us to push through this feeling many times. It is also this experience which we bring to the fore to ensure that you keep pushing towards your goals. Remember, the lessons you learn in the dojo help you with other areas of your life. As mentioned earlier, you made the commitment to participate in classes. If you do not keep the commitment going, you may also quit in other areas of your life. If you cannot keep the commitment going, how can you be the best leader, the best parent, or the best role model you can be? If you can demonstrate responsibility and commitment in the dojo, you can do it anywhere. Responsibility is something that can benefit every aspect of your life. You will start to think about the well being of others in all of your relationships. This shows a certain sense of compassion and service to others. In addition, you will become someone who can be relied upon, as you do what you say you are going to do. This is wonderful feeling knowing that others can really trust you….all because you are responsible. A responsible person knows to take ownership of their actions and choices. For you to achieve everything that is important to you, there is a right path and wrong path. Responsibility leads you to choose the right path, no matter how uncomfortable or hard that may be. For this week, take responsibility of everything you do. Your goals are a very personal thing which reflect what is really important to you. The flipside of this is that it is up to you to do what it takes to achieve your goals. I know you can do it.